Everything has been pretty hectic at home recently, and it has fallen upon me to cook dinner for the family a couple of evenings. One evening I tried out this great recipe from 30 Minute White Bean + Chicken Soup from How Sweet It Is, a food blog I have been following for quite some time now, one evening I made my red lentil ragu which I hope to make again for a blog post in my ‘Student Suppers‘ category soon. 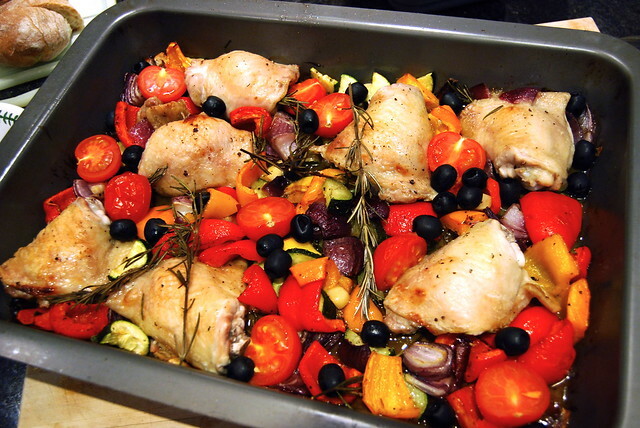 On Wednesday night I made one of my favourite Spring/ Summer dishes; Mediterranean Roast Chicken out of some loose vegetables and some chicken thighs I found in the fridge. 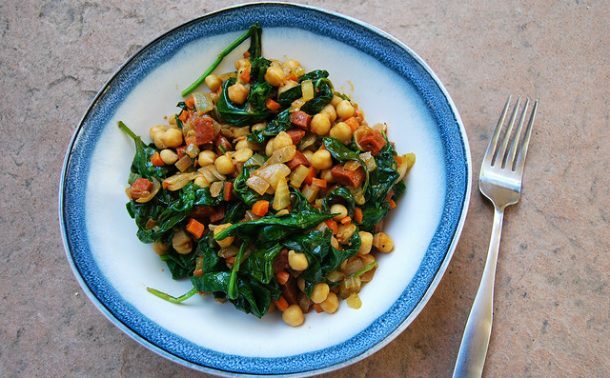 This is such an easy and such a delicious supper to make, and it can be made for any number of people! First, I like to make sure I have all my ingredients prepared, starting with the herbs. 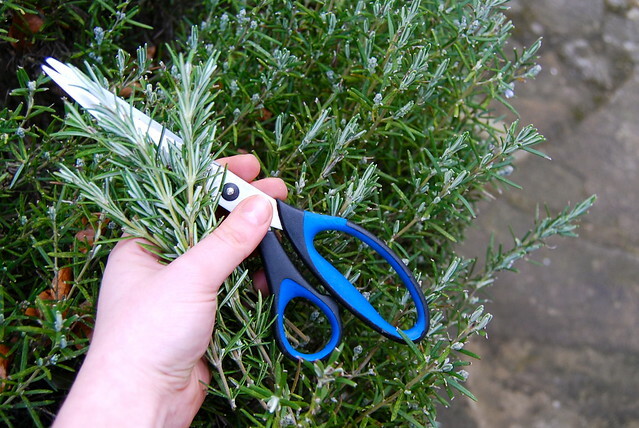 I personally think fresh Rosemary is best with this dish if you have any, but mixed dried herbs added at the salt and pepper stage also work. 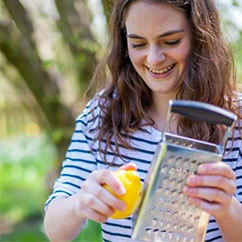 Next, roughly chop up whatever Mediterranean vegetables you have to hand roughly. 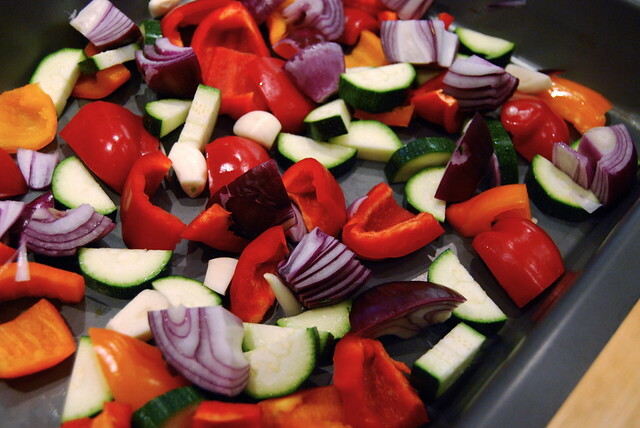 Add the ones that take a long time to cook at this stage, like red onion, red, orange and yellow peppers and courgette at this stage (halved new or small salad potatoes also work well, as well as roughly chopped lemon with the skins on , trust me on this one!). Also add a couple of skinned garlic cloves. 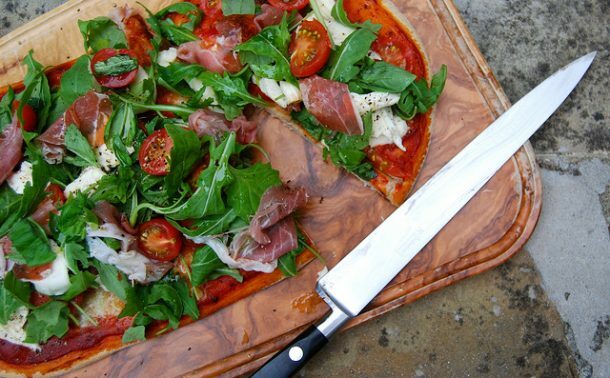 Set aside for later things like tomatoes and olives that do not take as long to cook. Pour about a tablespoon , maybe a little bit more of olive oil over the chicken . Add freshly ground salt and pepper, and use your hands to toss together. 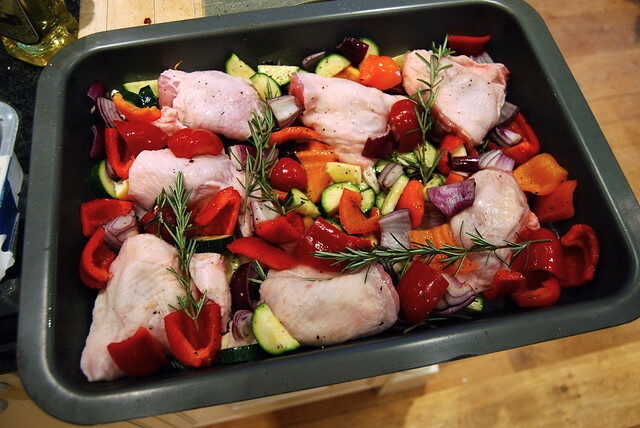 Then, nestle the chicken thighs in between the vegetables, taking care to run some of the seasoned oil over their skins, and tucking the sprigs of Rosemary around the chicken for full flavour impact. I cook this for about 3/4 of an hour in the Aga, adding the olives and tomatoes after half an hour and moving it up at that point to brown the chicken, but it will always depend on your oven. 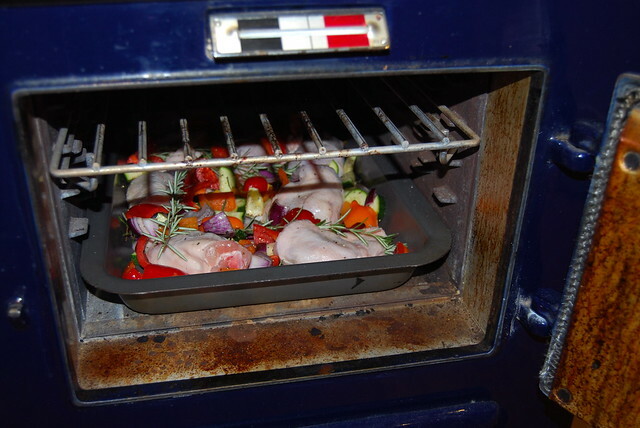 As a general rule, bake until the chicken is cooked through, add the rest of the vegetables, put until the grill and cook until the chicken is browned. 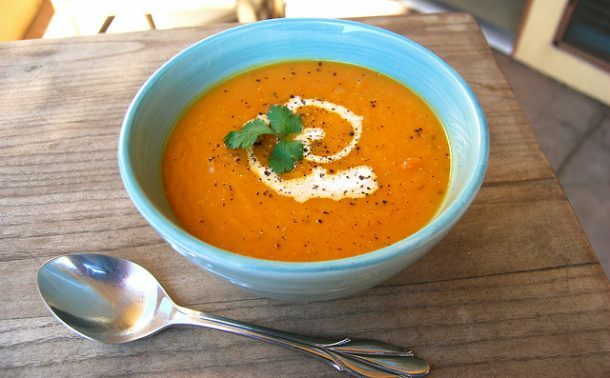 Serve with warn ciabatta bread to soak up all of the delicious juices. A personal favourite of mine is the one you can get in Waitrose for £1, and a nice chilled glass of white wine or rose. Let me know if you try this out, and what vegetables you decided to use – I’d love to hear all of your different combinations!